Posted on September 25th, 2015 by Jacob. Which is better? Film or Television? It’s a debate that’s been going for a number of years, but recently has become even more heated with what many are calling the ‘Second Golden Age’ of TV, with programmes such as ‘Breaking Bad’, ‘Mad Men’ and ‘Homeland’ receiving critical acclaim and ‘Game of Thrones’ breaking records at the Emmy awards. TV has becoming a much more credible medium within the last 10 years, but at the same time, cinema continues to offer immersive and excellent pieces such as ‘Captain Phillips’ and ‘Twelve Years a Slave’. Feature films are usually 90 – 120 long, meaning limited time to tell the story and flesh out the characters. Television can be as short as 4 hours, as long as 20 or even longer. Writers have a lot more time to explore the possibilities for story and characters. ‘Breaking Bad’ unfolds like a novel, showing a character’s development over a prolonged period of time, if it had been a film it almost certainly wouldn’t have been as extraordinary and fleshed out as it is in its current form. At the cinema it’s impossible to avoid all the marketing: trailers, posters and promotions for the next blockbusters; making their genre clear. TV doesn’t have as much of a genre restriction; there is a lot more creative freedom when it comes to plotting and tone. One episode of ‘Rescue Me’ has viewers sympathising with Tommy and commending him for bravery, then he does something irredeemable. Similarly with ‘Game of Thrones’; Tyrion Lannister’s witty anecdotes have viewers laughing, then a shocking event has them crying their favourite character is dead (again). 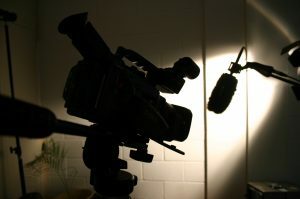 While television has more time to tell a story, films have limited time (unless they’re part of a franchise), while it can be restrictive, it means the filmmakers need to use their time productively, so the best content makes it into the script and only the best of that makes it onto the screen. The shorter stories of film can be just as powerful as the longer tales of the small screen. As far as television has come in the last decade, many still consider film as the pinnacle of achievements, there is a stigma of success attached to cinema, elevated from the perceived lower ranking of television, a lot of actors who have worked in TV, once they’ve made it to the silver screen, find it hard to go back. Both television and film have their strengths and weaknesses, ultimately it is down to the viewer whether they go spend an evening at the cinema with the latest blockbuster or at home watching the box or Netflix.